My exploration into solving the problem of how to store soft swimbaits. 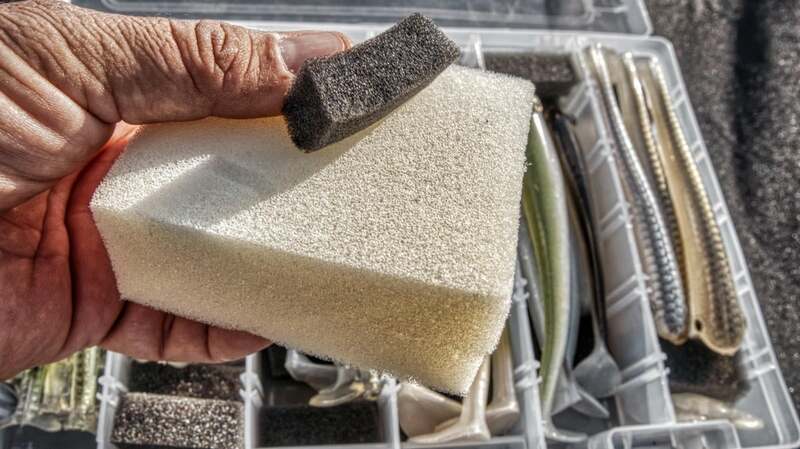 One of the many problems with fishing soft paddle tail swimbaits involves storing them. Either you have to have a big bag to store the clam shells and then you end up with clam shells everywhere and they are cumbersome to store on boats like a kayak or carry with you if you are fishing from the bank. 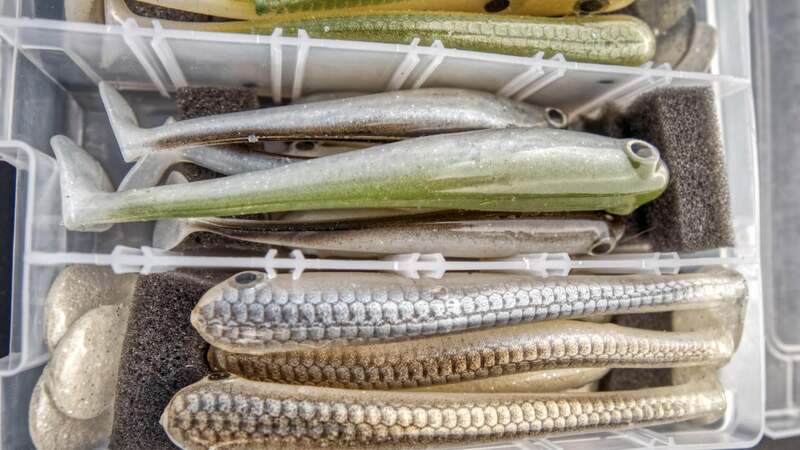 But if you put a bunch of swimbaits into a Plano stowaway or other hard tackle box, you end up with a bunch of swimbaits with the tails cocked over to one side, and they end up not swimming very well, if at all. 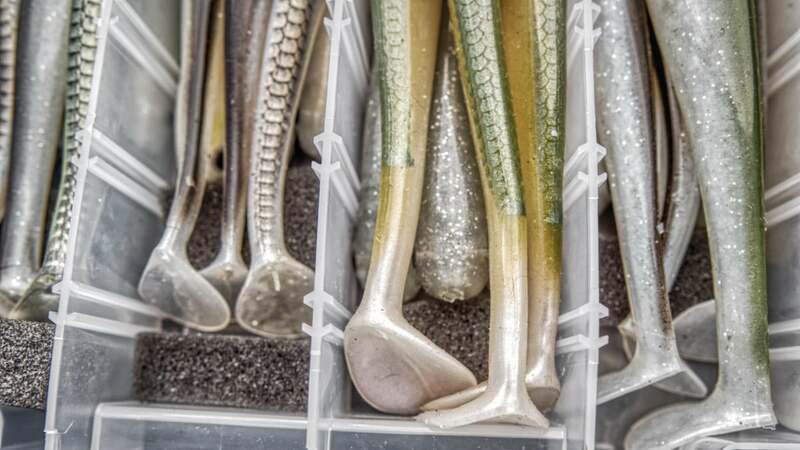 The weight of the other baits in the tray smush the tails until they end up taking that new warped position and shape. You can boil the tails to fix them but you want to be able to fish them out of the box. It's a bit of a conundrum if you want to carry multiple colors and sizes of your favorite types of soft swimbaits somewhat effectively. 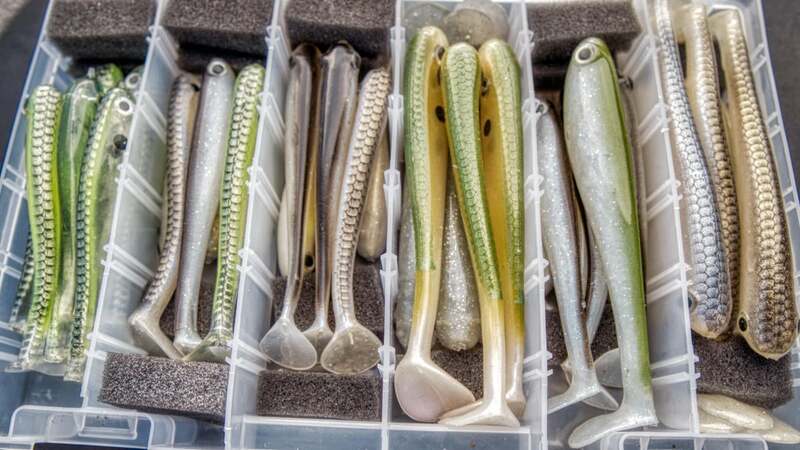 I've been playing around with an idea I had kicking around in my head on how to store a bunch of hollow bodied paddle tails like the Zoom Swimmer and Berkley Hollow Belly in a tackle boxes. What happens in those boxes is not only does the weight of the other swimbaits smash the tails and bend them permanently to one side or the other, but when the box stands on end, as often is the case in tackle bags or in boats, the swimbait itself pushes down on the tail and bends the neck and paddle sections. 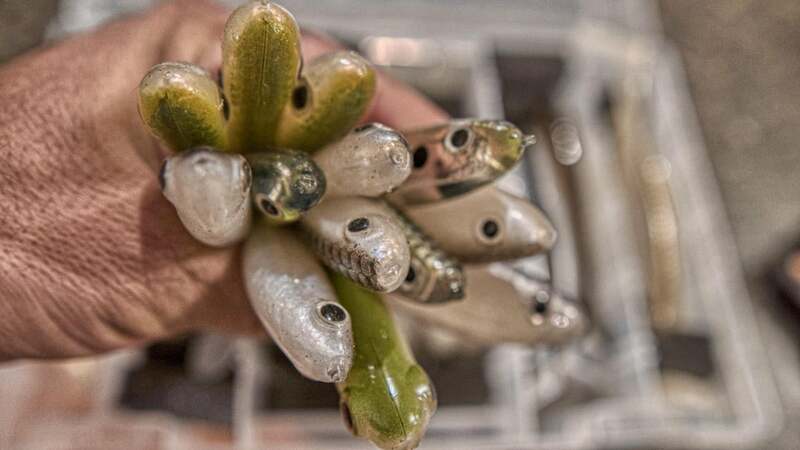 So I thought about ways to keep the swimbaits from resting on the tails or from squishing to one end of the tackle box or the other and further warping the tails. My idea was to use little foam inserts to give the tails something to "lean on" to keep them from bending and then also keep smaller swimbaits from sliding from one or other of the box and smashing. Really all you need is a piece of foam and something to cut it with. I didn't get really scientific here. I grabbed some of the foam that comes in fishing reel boxes to protect the reel and a pair of good scissors and started cutting up small rectangle inserts from the foam piece. Now I will admit there probably is some sort of foam that might react with the plastics and warp or otherwise mess up in the heat. I'm not a chemical engineer, and I didn't test different types of foam. So you might have to do a little experimenting there. But the foam I used did work in my testing of this idea. Next, I laid 3 swimbaits in a tray on their back so that the tails were up. Then I put a foam insert on the neck of the tail just in front of the paddle. Then I laid another row of three in front of that with their tails hanging back over the other swimbaits or another piece of foam. Then I put a piece ahead of those swimbaits to take up the space to be able to move forward and back. I repeated this with different length swimbaits and moved the dividers accordingly to support and protect the tails needed underneath and on the ends. It can take some finagling to get the tails in there evenly and create space with a couple pieces of foam. 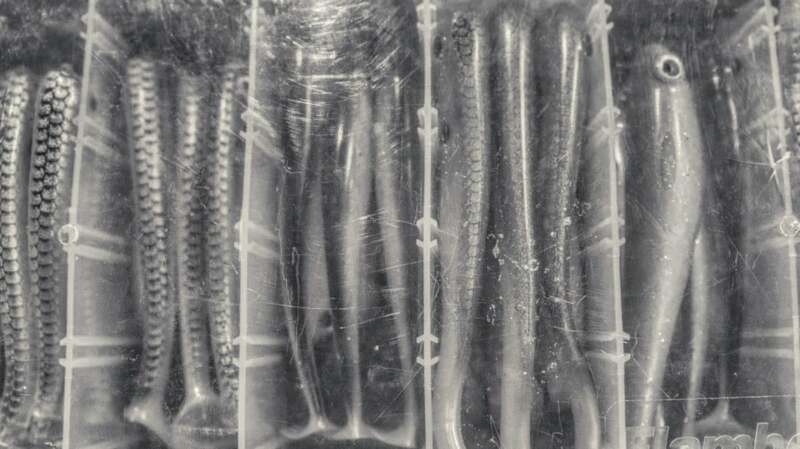 You are basically forming a pocket where the tails can lay unobstructed by other baits. Also if your swimbaits are real gummy or sticky, you might need to apply some scent or something to make them slip into place a little easier. The result was what I think is a simple way to get a bunch of swimbaits in a Plano box without fretting over kinked and warped tails. I've had 40 hollow bodied paddle tail swimbaits in that box now for three months and not one of them has a kinked tail. I purposely left the box in my truck, in my boat. I left it on the deck of the boat all day in the sun and left it outside in below freezing conditions to see if I could get the tails and or foam to mess up. The result is I have 4 different sizes of 40 paddle tails in a box ready to fish anytime. I'd be really interested to hear any other ideas you might have for storing baits like this or some tricks you think might work for expand on this idea to keep them stored right. Hopefully it helps some guys not waste money on warped swimbait tails in the future. 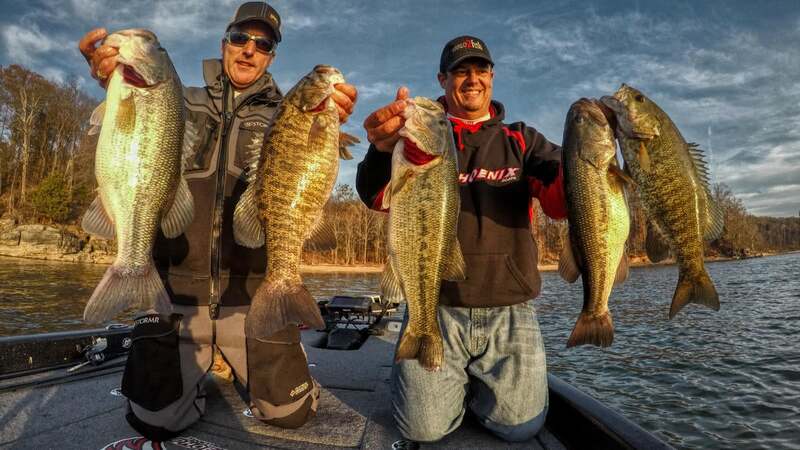 Shown in this picture are 4-inch Zoom Swimmers, 5-inch Zoom Swimmers, 4 1/2-inch True Bass swimbaits, 5-inch Berkley Hollow Bellies and 5 1/2-inch True Bass Swimbaits.